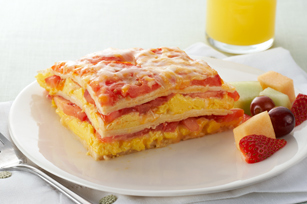 Tower, pile or stack...no matter what you call layers of egg, cheese, tortilla and fresh tomato, you gotta also call it one of the best brunch recipes ever. Cook eggs in skillet sprayed with cooking spray on medium heat 5 min. or until set, stirring occasionally. Remove from heat. Place 2 tortillas in 9-inch pie plate, overlapping as necessary to cover bottom; top with half the eggs and 1/3 each of the cheese and tomatoes. Repeat layers. Top with remaining tortillas, cheese and tomatoes. Bake 10 min. or until ingredients are heated through and cheese is melted. Sprinkle with 2 Tbsp. chopped fresh cilantro just before serving. Serve with TACO BELL® Thick & Chunky Salsa. Serve with a fresh fruit salad.